IT’S easy to miss Felipe Conde’s workshop. 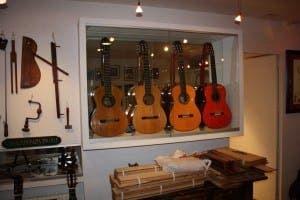 Spain’s most revered guitar maker is modestly tucked away in a Madrid basement, a stone’s throw from the Theatre Royal. But then, Felipe Conde Guitars doesn’t need to flaunt its name. Since 1915, this family of luthiers have furnished guitarists with the very best and, like Rolls Royce, the Conde name carries its own mark of excellence. 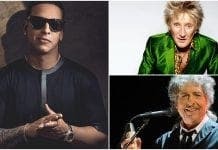 Bob Dylan, David Byrne, John Williams, Lenny Kravitz, Leonard Cohen and Camarón de la Isla are among the many guitar greats who chose Condes. 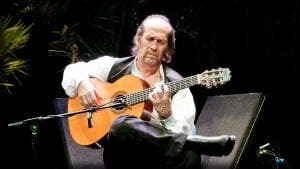 The late Algeciras maestro Paco de Lucia even spent his youth practicing flamenco in the old Conde workshop after his father relocated to Madrid. Felipe Jr’s father, Felipe, learnt songs and techniques from the budding young genius, whom he describes as ‘quiet and timid’. 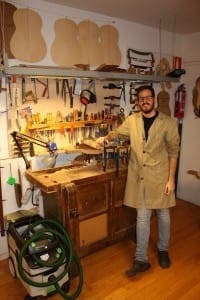 “My grandfather, Mariano and great-uncle Faustino made Paco de Lucia’s guitars,” says Felipe Conde Jr, 25, the fourth generation to work in the family trade. “They had a really close relationship with him. Paco came to Madrid when he was 12 or so. ”My great uncle and grandfather would babysit him. The basement workshop is a guitar shrine where rows of finely tuned, highly polished instruments line up behind a glass cabinet. On the wall, photos of flamenco stars beam out. 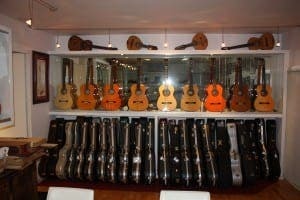 In the corner is a collection of vinyls by artists playing with Conde guitars. Nowadays, Felipe Jr works alongside his father Felipe and 27-year-old sister Maria. But the shop’s roots can be traced back to the 19th century, when founder Domingo Esteso – Felipe’s great, great uncle – first learned the trade. After opening the first shop at 7 Calle Gravina, Esteso exported guitars to Argentina, where the country’s strong tango tradition and wealth ensured a healthy trade. But during the Civil War’s long siege of Madrid, Esteso developed a lung disease and died when he was unable to get penicillin. His widow Nicolasa Salamanca and nephews Mariano and Faustino took over the reins. Felipe senior and his brother Mariano Conde Jr. were next in line. The heyday for Spanish guitar making was the 1960s when, Felipe Jr tells me, most of the guitars in the world were made in Spain. But despite the passing decades, the Conde sound has remained distinctive, he says. 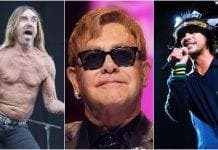 “It was very easy to recognise our guitar years ago as it was pretty unique,” he says. 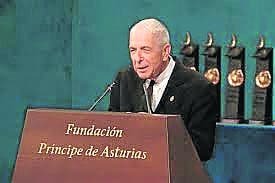 Following Leonard Cohen’s death in November, the celebrated international artist’s moving speech at the Prince Of Asturias Awards was widely circulated on social media, revealing an astonishing secret not even the Conde family knew. 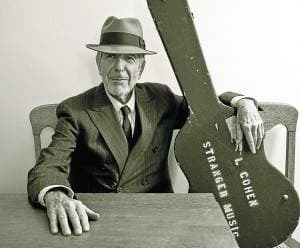 Cohen had played a Conde guitar for 40 years. 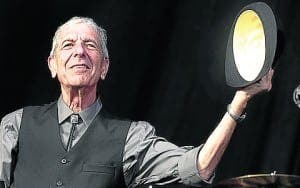 The speech was an extraordinary, poetic homage to Spain, to flamenco and to Conde craftsmanship, with Cohen acknowledging the debt he owed (an extract from the full text is printed below). 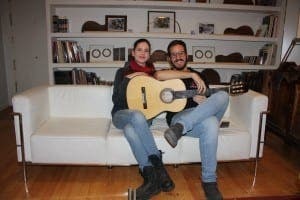 It came as a complete surprise to the Conde clan that one of the world’s most famous musicians had one of their guitars and actually attributed it to his success. “When he bought the guitar from my grandfather, Leonard Cohen wasn’t famous, he was really young,” says Felipe Jr.
“My grandfather liked classical guitar and flamenco music. “They were really into Spanish musical tradition more than a young guitarist who probably not that many people knew in Spain. “When they gave Cohen the Prince of Asturias prize he spoke and we were like, ‘Wow, he has one of our guitars’. We didn’t know. “You don’t hear very often any words of gratitude from the artists that play your guitars. After the speech we had contact from his management, which was quite cordial. 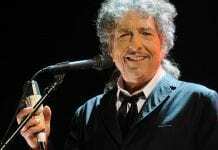 “A similar story happened with Bob Dylan. 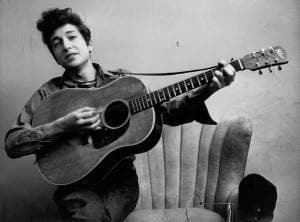 Probaly Dylan met a classical or flamenco guitar player and he said, ‘Which guitar are you playing’. They said Conde Hermanos. The pursuit of excellence starts with the raw materials. The day I visit the workshop, Felipe has travelled to Valencia to source wood, some of which is imported from as far away as Mexico, Canada and Brazil. Once selected, the wood is dried naturally for years. Different guitars need different wood. For classical guitars, the soundboard – the main curved body of the guitar – is spruce or red cedar. “Flamenco guitars need to be a really direct sound, really percussive and bright. “Cypress gives a lot of those qualities,” explains Felipe. “Spanish cypress is the only wood we use that comes from Spain. It’s a beautiful image, one Cohen or Dylan would be proud of. From death springs music, that most life-affirming and timeless human endeavour. A Conde flamenco guitar can cost anything from €2,500 to €9,500. But anyone raising an eyebrow here should consider what goes into making them. Felipe Jr spends around two months making just one. And after finishing in the workshop, he continues toiling at home. The finest wood is imported from around the world and meticulously examined before it is bought. Sometimes it is dried for decades to ensure the best sound. Conde also guarantees your guitar if it breaks (although any Pete Townshend-esque acts of deliberate sabotage aren’t covered). Factor in all that love, skill and care and it’s clear these guitars are more than worth the price. “You don’t get rich being a guitar maker,” Felipe Jr tells me. Of course, the Conde guitar has always been closely linked to the flamenco community. At world-famous Madrid venues like Casa Patas, aficionados can appreciate the genre’s masters at work. The crowds, and the money, are in the capital. “An Andalucian would probably get mad at me but a lot of the best flamenco in Spain is in Madrid,” says Felipe Jr.
As we talk, Felipe Jr. shows me two guitars he is currently working on (he always makes two at the same time so he can work on one while the glue is setting on another). He points to wooden extensions added to the legs of his work table over the years to cater for his growing height (he began working here aged 16). The patience and devotion required means this is not for everyone, he says. A vocation, not a job. “I spent four years studying sociology at university, but I decided I don’t want to do that,” he says. What is he working on right now? Perhaps for the next Leonard Cohen, waiting to take up the mantle. “I have a Conde guitar, which was made in Spain in the great workshop at Number 7 Gravina Street; a beautiful instrument that I acquired over 40 years ago. “I took it out of the case and I lifted it. It seemed to be filled with helium, it was so light. “And I brought it to my face. I put my face close to the beautifully designed rosette, and I inhaled the fragrance of the living wood. You know that wood never dies. “I inhaled the fragrance of cedar as fresh as the first day that I acquired the guitar. “And so I come here tonight to thank the soil and the soul of this people that has given me so much.